I was very surprised and honored to wake up and see that The Matagorda Advocate article about me being an Us Weekly Fashion Police Top Cop was on the front page! 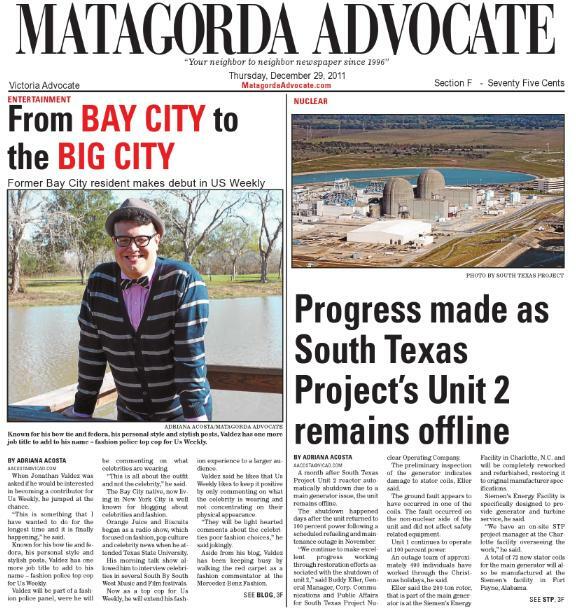 Special thanks to The Matagorda Advocate Editor, Adriana Acosta for the photo and story that you can read below. When Jonathan Valdez was asked if he would be interested in becoming a contributor for Us Weekly, he jumped at the chance. “This is something that I have wanted to do for the longest time and it is finally happening,” he said. Known for his bow tie and fedora, his personal style and stylish posts, Valdez has one more job title to add to his name – fashion police top cop for Us Weekly. Valdez will be part of a fashion police panel, were he will be commenting on what celebrities are wearing. “This is all about the outfit and not the celebrity,” he said. The Bay City native, now living in New York City is well known for blogging about celebrities and fashion. Orange Juice and Biscuits began as a radio show, which focused on fashion, pop culture and celebrity news when he attended Texas State University. His morning talk show allowed him to interview celebrities in several South By South West Music and Film festivals. Now as a top cop for Us Weekly, he will extend his fashion experience to a larger audience. Valdez said he likes that Us Weekly likes to keep it positive by only commenting on what the celebrity is wearing and not concentrating on their physical appearance. “They will be light hearted comments about the celebrities poor fashion choices,” he said jokingly. Aside from his blog, Valdez has been keeping busy by walking the red carpet as a fashion commentator at Mercedes-Benz Fashion Week. Valdez credits social media for building a lot of his working relationships. “Social media has gotten me where I am today,” he said. “This is how I was able to be a part of Us Weekly. Valdez said Sasha Charnin, fashion director editor for Us Weekly follows him on Twitter and read his fashion blog. His morning talk show was a popular morning show that allowed him to interview celebrities in several South By South West Music and Film festivals. Aside from being a fashion and celebrity blogger, Valdez does freelance public relations. Valdez said he is looking forward to 2012 with big projects coming soon. He will also continue blogging celebrity and fashion news, be a red carpet commentator at fashion week and part of the fashion police for Us Weekly. He hopes to also do a lot more television and radio as a guest commentator. “For now, I am just so excited to be a part of a national magazine that allows me to do what I love,” he said. 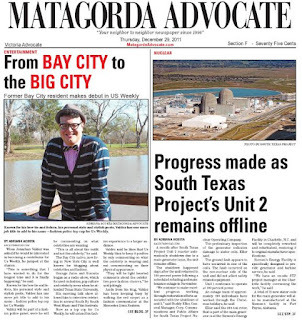 For more information on The Matagorda Advocate and to read the complete online version of this story click here.